We have all experienced the sinking feeling of needing some food before a long train journey and knowing that train stations (like airports) are notoriously difficult for finding gluten free food. These London British Rail stations all have options – even some sit down restaurant meals if you have time to spare. All of these train stations are connected to underground (tube) stations if you want to pop out for some food on route somewhere. Website links and reviews for restaurants are at the bottom of the post. If you are also travelling through Heathrow or Gatwick airports, please see the London airports post. This post was last updated in November 2016. 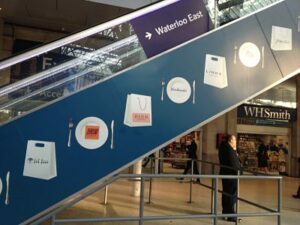 King’s Cross and St Pancras are next door to each other, so if you have time you can visit St Pancras for more options (eg Carluccio’s). If you are a tourist/Harry Potter fan, don’t forget to find platform 9 3/4! Prezzo – GF pizza and risotto – ask for allergen information. Plenty of seating. Wasabi – sushi. Nutritional information on website – no GF soy sauce mentioned. 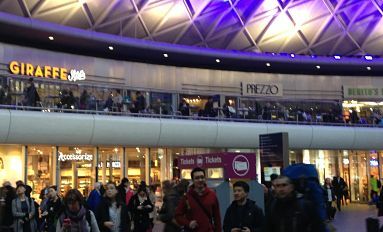 Waterloo is quite a big station that has shops on the ground floor platform area, upstairs and there is also a McDonald’s downstairs where the Jubilee line exits. If you are using Waterloo East, get your food at Waterloo first. Mi Casa – Mexican so usually some options – salad at least! 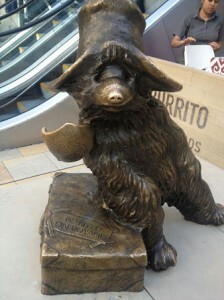 If you are a tourist – don’t forget to find Paddington Bear (near Bar Burrito)! Bar Burrito – corn tacos and nachos. No GF menu, check with staff. Zizzi’s – GF pasta and other meals – good if you’ve got a lot of time to kill! Caffe Nero – tiny one so no GF sandwiches when checked (Aug 2013) – worth checking for a GF cake though! Victoria is a big station and also has an upstairs food court as well as the ground floor platform area. The first Mission Impossible movie was filmed at Liverpool Street station – so your mission, if you choose to accept it, is to find gluten free food! Wetherspoons pub – Hamilton Hall – pub food – GF marked on menu. Jacket potato is a good option. Moshi Moshi – sushi but not sure if gluten free options – worth asking (no mention on menu) Weekdays only. Charing Cross is a very small mainline station, but you can still find some snacks there. 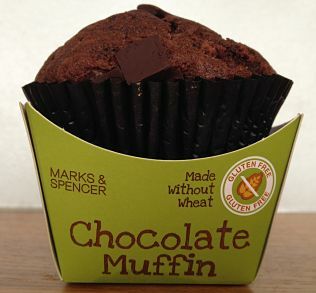 M&S Simply Food – good for a salad and some fruit. This store had Free From chocolate muffins. Boots – in fridge section – carrot sticks, olives and ‘Made without wheat’ Salted Caramel. If you are going to York, also see the post on York train station. Dear Caroline, having been GF for 12 years I can say that unfortunately both Burger King and McDonalds both use flour in their burgers. Burger King also uses coating on their fries to make them crispy so they are also not gf. Thanks, will have another look at their allergy list! I’ve checked the UK allergen listings and both clearly say their meat patties are 100% beef. BK also doesn’t list any allergens for their fries, although I can’t find if they are fried with gluten containing ingredients. McDonalds also have no allergens for their fries but state they may be fried with gluten containing products. Always best to check in store!